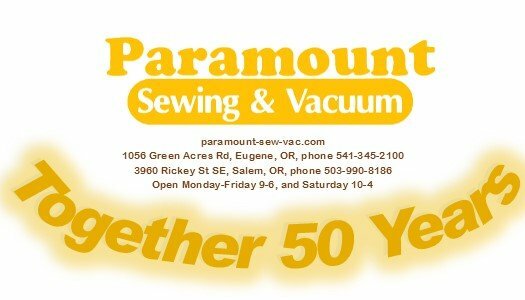 Over the next three years, we want to see your sewing machine for regular service. This will ensure that your sewing machine stays in tip top shape. It will also give us an idea of how you use your machine, and a recommendation for services past the initial three year period, at a discount. This is entirely up to you. You will not be penalized if you don't bring it in, it is your machine. Our Platinum Plan includes MUCH MORE than just your service! Our class program is designed to educate you on all the features of your sewing machine. The classes are broken up into segments depending on the capabilities of your new machine, and can be taken at EITHER location. Please ask an associate to guide you into the classes that best fit with what your new machine will do. Our discount program is designed to maximize your dollar on the items you use the most in sewing. Our thread selection is vast! We try to stock all the feet for your new machine as well, what we may currently not have in stock; we can surely order quickly. We offer many events throughout each year. You choosing to bring your machine here and/or buy your machine from us, also will get you a discount and an invitation to these via email or e-news weekly ahead of the general public! 1. 3 years UNLIMITED Service. 2. Instruction lessons for your new machine to maximize all the features you now have. These lessons are for the life of that machine while you have it. 3. 15% off MSRP on most notions, threads, fabrics, stabilizers, presser feet, hoops, and embroidery designs for the 3 years. 4. 1 year to trade up your machine. Within that year, you can get credit for 100% of what you paid towards the next direct class of machines. 5. Free membership in Club Paramount! This includes invitations to special events and classes. 6. Priority Service. This means your new machine will be put in line just behind those that have this certificate and brought them in. This Service warranty covers all parts and labor for the specified period, 3 full years after date of purchase. Items not covered are limited to customer abuse or complete neglect, at which time will be at the discretion of Paramount Sewing & Vacuum Management. Water damage and damage from power surges are not covered as well. Services would and could still be performed and completed on aspects stated above, additional charges may incur.